You wouldn’t expect yourself to cook in the kitchen without the proper knives, pans, and pots, and you wouldn’t expect to build your body at the gym without the proper equipment either, right? Think about creating your ideal lifestyle in the same way that you think about cooking or building muscle at the gym. While you could achieve your goals without any assistance, the right tools will help you to achieve your goals faster, more efficiently and much more easily. So why not use them! 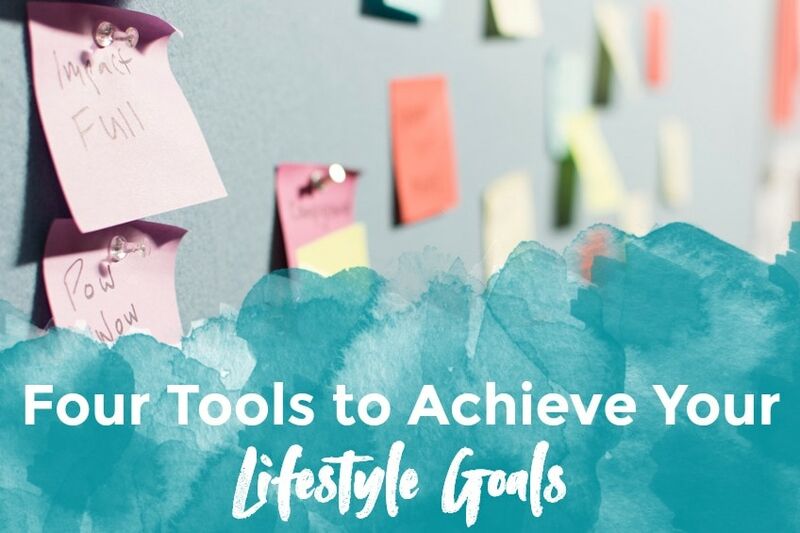 Let’s dig into the the four different types of tools you can use to help you track your progress, achieve your goals, and work your way to a better life. Although this doesn’t seem to be the go-to tool for many of those seeking lifestyle freedom in this day and age, the journal is a classic tool that is both affordable and useful. Journaling is best for those who are looking to track their progress as they make changes in their daily lives. When you take a look at your journal each day, you are constantly reminding yourself of the goals that you have set. Even better, you can use the journal to also keep track of the progress that you have made, make a definitive list of actions that will help you reach your goals, and list of all of the things that may not be working as well. Also, the journal is a tool that is highly customizable. If you’re someone who wants to meet their lifestyle goals without having too many distracting features, you can choose to make a bullet journal. If you prefer visuals that remind you of where you are going and motivate you, you can paste pictures and draw inside your journal. Vision boards are one of the most used tools today to help people reach their goals. A vision board is essentially a collage filled with objects, pictures, sayings, and other small pieces that represent the future you would like to have. While a journal may be too demanding for some people, a vision board is almost perfect for everyone who is wishing to change their lifestyle. However, it will take a small time investment initially when you begin putting it together. Even simpler than the above two methods, you could leave sticky notes in places where you are sure to see them and remind yourself of your goals. For those of you who may want to incorporate more mindfulness into your daily schedule, you can place a sticky note by your bed that reminds you to breathe and meditate every morning. If you’re someone who wants to work less and spend more time with your family, you can place a sticky note at your place of employment that tells you to work smarter and not longer. Whatever it is that you are setting out to do, a simple sticky note with an important reminder can help you to achieve it. Not everyone is into creating physical manifestations of their goals and that’s absolutely okay. If you’re still creative and would like to make a digital version of these tools, that works just as well as a physical version. Make no mistake, tools are helpful and are sometimes necessary for people who need that extra push in order to develop their ideal lifestyle. However, there is a line that people sometimes cross when people begin buying more tools than they need. This is what I’ll be addressing in the next episode. If you want to take your goal setting even further in 2018, and make some real changes that last, then you need to plan your year out differently. And I offer a completely different approach to doing that and setting your goals in my Plan Your Ideal Year Online ‘Doing’ Masterclass . SET YOUR VISION FOR 2018 and plan out your entire year so you prioritize what matters – we will map this out real-time together and I’ll show you behind the scenes of how I plan out my year. MAP OUT YOUR QUARTERLY, MONTHLY and WEEKLY ACTIONS based on your annual goals and the calendar so you know exactly what to do to achieve amazing results in your business in 2018! EDITORIAL CALENDAR so you feel focused and in control – I’ll show you my calendar as a real example of what’s possible. Learn my 6 STEP DAILY SUCCESS PLAN to become more productive in a week than you are in a year – no seriously. Make sure you sign up here and get started today. In 90 minutes or less you could have your entire 2018 on track and all planned out for personal and professional success – and of course freedom! HostGator has partnered with me to help my listeners get started. Click the link below to get 50% off any shared hosting plan.